Orlagh Cassidy and Brontë England-Nelson in Acolyte. Photo by Carol Rosegg. BOTTOM LINE: Summer Shorts Series A offers a variety pack of short plays of vastly differing tones and subject matter; all are entertaining, although one outshines the others. 59E59 returns with their summer shorts, which gives an opportunity to see short works by well-known directors and playwrights, some of which end up as short films through the festival's stage to screen initiative. Jack opens on a park bench in a Union Square dog run where a divorced couple has agreed to meet to scatter their dog's ashes. Maggie (Claire Karpen) is despondent with grief and furious with her ex George (Aaron Roman Weiner filled in for regular cast member Quincy Backer-Dunn at the performance I attended), wanting to know why he didn't try harder to get in touch with her when their dog died. As George recounts that day, the two revisit their fifteen years of marriage and the raw emotions both have been holding back. Their dog comes to represent the fruit of their relationship; losing him is losing part of their lives together. 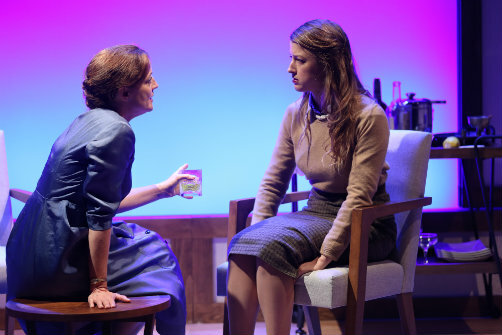 Playwright Melissa Ross shows a knack for the minor dramas of everyday life, whereas the two-person cast, under the guidance of director Mimi O'Donnell, convincingly portrays the messy, sometimes illogical emotions that come unearthed in a breakup. Wedged in between two heavier-hitting works is Playing God, a light-hearted play that has the feel of a Saturday Night Live skit, perhaps because playwright Alan Zwiebel was a writer for the show during its early years. In Playing God, self-absorbed ob-gyn Steven (Dana Watkins) wants to go on a ski trip while one of his clients is due to give birth, so he decides to induce labor a few weeks early. Enraged that someone is “playing God” by doing such a thing, God himself (Bill Buell), replete with white robes, decides to come down from the heavens and trounce the doctor in a game of squash to show him who is really boss. The play is rather slight, but there are a few witty one-liners worthy of laughs. Acolyte tells the real life story of a decades-long affair between Ayn Rand (Orlagh Cassidy) and one of her married followers. While sipping on after-dinner cocktails, philosophy student Barbara (Brontë England-Nelson) and her husband Nathaniel (Sam Lilja), a devoted Rand follower, debate how to follow one’s desires in a way that aligns with one’s philosophical ideologies. Rand and Nathaniel use her objectivist philosophy and its justification of selfishness to persuade Barbara to let her husband to sleep with Rand. In a fascinating war of ideals and logic the three argue their cases, while Rand’s husband Frank (Ted Koch) drunkenly sits in the corner, shrugging off his wife’s desire for infidelity. Compared to the other short works, Acolyte is tauter, with a faster pacing and a more sophisticated premise, providing plenty of food for thought once the curtain has come down. Playwright Graham Moore (who won an Oscar for his screenplay for The Imitation Game) skillfully builds tension in the dialogue, while director Alexander Dinelaris (who also won an Oscar for Birdman) has the emotions mount in a slow boil. Summer Shorts Series A is by Melissa Ross, Alan Zweibel, and Graham Moore. Directed by Mimi O'Donnell, Maria Mileaf, and Alexander Dinelaris. Set Design is by Rebecca Lord-Surratt. Lighting Design is by Greg Macpherson. Sound Design is by Nick Moore. Stage Manager is Jenna R. Lazar. The cast is Claire Karpen, Quincy Backer-Dunn, Orlagh Cassidy, Brontë England-Nelson, Sam Lilja, Bill Buell, and Dana Watkins .